Dress up your walls with fabric for an easy to install design that can be changed out anytime. 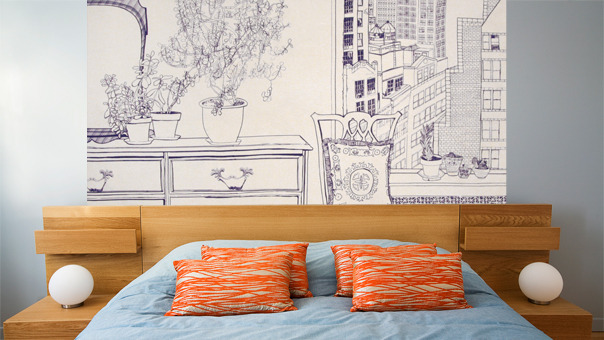 This is a great idea for those who rent and don't want the hassle of taking down the wallpaper when moving out. It's also perfect when you want to try out colors/patterns in the home. One of the benefits of using fabric to cover your walls instead of wallpaper is that fabric is much easier to remove. Simply spray the fabric with a mist of water, and pull off your wall. Here are the directions from the Nate Berkus show. Easy as pie! 1. Before you begin, wipe down your walls so they're dust and dirt free, and tape over outlet holes with waterproof tape for safety. Place a plastic drop cloth below the space where you're working for easy cleanup. 2. Measure the wall you plan to cover, and cut out the fabric accordingly. Leave at least one inch of additional material where the fabric meets the floor, the ceiling, and around windows and doors. (This will account for any shrinking that may occur when starching the fabric. You'll trim the additional material after the fabric been mounted to the wall and is dry.) TIP: When adhering fabric to walls, lightweight fabrics work best. 3. Pour the liquid starch into the pan, and use your paint roller to apply starch to the top half of the wall. 4. Stick the fabric against the top half of the wall and smooth it out. If necessary, use push pins to temporarily hold the fabric in place. Apply more starch to the wall as needed, and work your way down the wall, attaching and smoothing the fabric over the surface. 5. Apply starch to the top of the fabric, continuing to smoothing out wrinkles or air bubbles. Make even strokes with your paint roller. 6. Let your fabric dry completely, then use an x-acto knife to trim any additional material from the ceiling, floor, and around doors and windows. Want to remove the fabric from your walls? One of the benefits of using fabric to cover your walls instead of wallpaper is that fabric is much easier to remove. Simply spray the fabric with a mist of water, and pull off your wall. Clean the starch from the wall with water and a sponge.